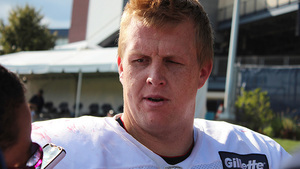 Jordan Devey is a professional football offensive lineman, currently playing for the New England Patriots. He is a member of The Church of Jesus Christ of Latter-day Saints. On April 27, 2013, Devey signed with the Baltimore Ravens as an undrafted free agent. In September of that year, he signed to the New England Patriots practice squad. He was promoted to the active roster for the 2014 season. He was part of the Patriots’ Super Bowl XLIX championship. Devey was born on January 11, 1988, in American Fork, Utah. He excelled in basketball, baseball, and football, but after being diagnosed with Osgood-Schlatters disease, he set aside sports and played the tuba, trombone, and violin instead. He never played football at American Fork High School. But after serving his mission to Costa Rica, and after his condition improved, he decided to play collegiate football and walked into Snow College seeking a chance. He finished his sophomore year with his team ranked number 7 nationally. He then took the offer to play from the University of Memphis and studied accounting. Devey married Linsey Hodgkiss in 2011. They have one son. This page was last edited on 25 June 2015, at 13:52.